“…please don’t make the mistake of thinking the arts and sciences are at odds with one another. That is a recent, stupid, and damaging idea. You don’t have to be unscientific to make beautiful art, to write beautiful things.” – Tim Minchin, occasional address, UWA, September 2013. That crucial symbiosis between science and art could scarcely be better exemplified than it is by the more than four decade partnership between Joseph Forshaw and William Cooper. The pair have commonly been referred to over the years as scientist and artist respectively, but, I think, those descriptors apply just as accurately the other way around. 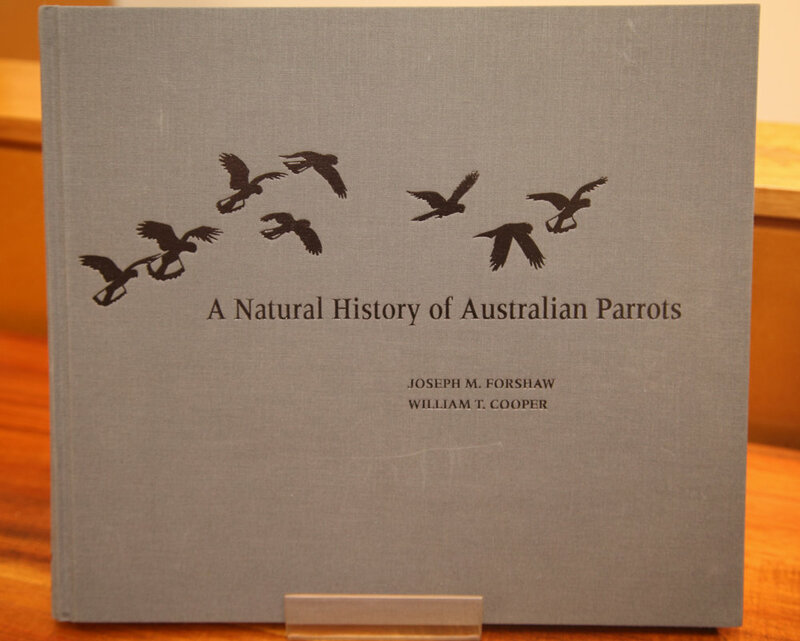 Cooper was as much a researcher as a “portrait painter to the birds”, as he was dubbed by Sir David Attenborough. He spent a large portion of his time in the field, observing birds in the wild, capturing their essence in reams of notes and field sketches, before bringing them back to life in his studio. And Forshaw, as much as being a respected expert in his field internationally, has an undeniable talent for rendering that expertise accessible and enjoyable to the lay-reader. I was lucky enough to pop along to Andrew Isles Natural History Books to view the only advance copy of this book in existence. The remainder of the very limited print-run are, at this moment, in a container, Australia-bound, in preparation for the launch in a few days. The initial impression of the book is that it is a very serious collector’s edition. It has 344 pages printed in landscape format at quarto size on beautiful stock which displays the plates at their best. Andrew Isles’ website tells us it is, “fully cased in grey Ballantine cloth, with black blocking and marbled endpapers”. Whatever a “Ballantine” is (I was sure that it was a brand of Scotch), it does its work well. The advance copy that I viewed was a thing of great weight and beauty and I can only assume that the remainder of the edition will be its equal. My photographs here do little justice to the book’s majesty and the vibrancy of the colour reproductions but it will remain on show in-store at Andrew Isles Natural History Books until the launch for those who are interested in seeing it first-hand. There are numerous plates which have never been published before, including a multitude of Cooper’s field sketches and pencil studies for most species. There are also a number of plates exhibiting Cooper’s additional talents as botanical illustrator and landscape painter. 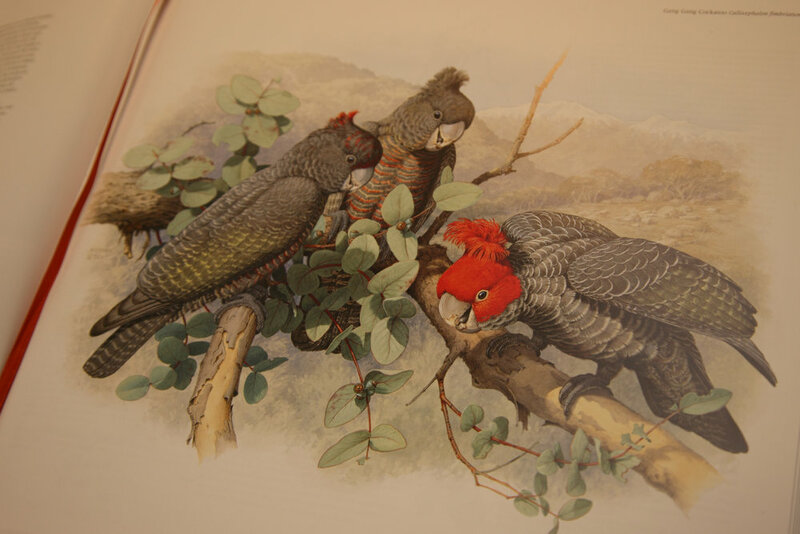 While the cockatoos toward the front of the book are colourful, big-on-the-page and arresting; there is a plate much later in the book depicting Golden-shouldered Parrots perched unobtrusively on a termite mound, almost like incidental ornaments to a sweeping panorama of Cape York tropical savanna. This, for me, is the real genius of Cooper’s work. He gives us the birds carefully posed for scientific scrutiny and field mark diagnosis. He also depicts them for us in their habitat for scale and relevance. But often, he also presents them as we would most often encounter them. We rarely see cockatoos any other way but quite well. They’re large, noisy and, mostly, fairly obvious in the landscape. But those smaller quieter Psephotus parrots might more usually be noticed at the last second; perched silently on a branch or termite mound, before flushing at your unintended disturbance. 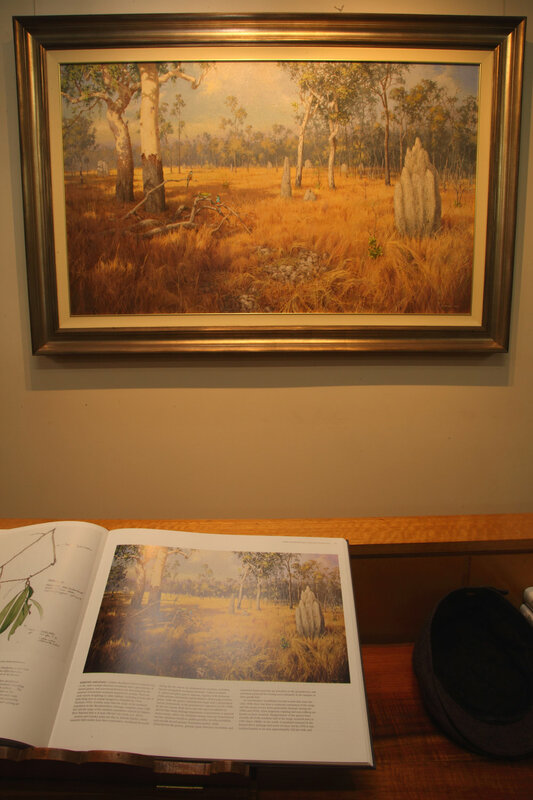 Andrew Isles actually has the original painting of the Golden-shouldered Parrot scene that was reproduced as a double-page plate for this book and it hangs, fittingly enough, over the area where the book is on display. My thanks to the publisher for the suggestion and to Andrew Isles and his staff for putting up with my intrusion. I look forward to the launch and hearing the reception that this highly anticipated book receives.